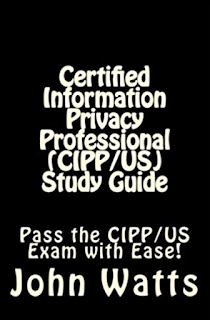 When preparing CIPT, CIPP/e and other certification exams from the International Association of Privacy Professionals I found very limited free preparation material and test quizzes. So, I thought I might as well share my notes as a cheat sheet on this blog. They come from my reading of several reference books and training materials, etc. Enjoy and save a lot of money! 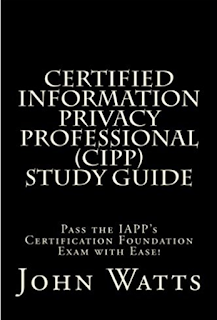 For IAPP CIPP: Certified Information Privacy Professional (CIPP/US) Study Guide: Pass the IAPP's CIPP/US Exam with Ease! PS: have a look to part 2 of these notes to have a complete overview of what you need to remember to succeed in the exams. sensitive personal information = must be even better protected. Related to medical records, sexual life etc. Processing it requires explicit consent from the data subject in most cases. Threat: any event with the potential to adversely affect operations / assets. Active data collection: the data subject actively provides the data (e.g., through a form). Passive: e.g., through proxy and server logs. Privacy protection approaches depending on countries: sectoral (heath, credit, ads... like in Brazil) vs comprehensive approach (like in EU) vs co-regulatory model including laws and binding industry codes (like in Australia and Canada). OECD guidelines (1980): collection limitation, data quality, purpose specification, use limitation, security safeguards, openness, individual participation, accountability. Switzerland, Iceland, Norway are European Free Trade Association (EFTA) members and follow the EU privacy directive. Switzerland has "adequate" privacy protections that simplify data exchanges with EU countries. EU 95/46/EC directive (1995) is a comprehensive legal framework for the processing of individual data. EU framework is probably the toughest in the world. For instance, employee data is better protected than in the USA. EU law: EU members need to pass national laws to be consistent with the EU privacy directives. USA: HiPAA (health), CoPPA (child protection), Can-SPAM (anti-spam... Some states such as Massachussets and California are in advance on these laws. For instance, location data related to children under 13 is protected by CoPPa: should be treated carefully. Cf. inmobi's fine from FCC. Canada: federal privacy act vs provincial laws. South America: very variable levels of protection. Uruguay and Argentina have "adequate" privacy protection according to EU. Eastern European countries: most of them have similar frameworks as the EU privacy directive. Russia's law is considered as even more stringent than EU laws. Middle East / Africa: little data protection in most countries. Very variable depending on countries. There is no information privacy (rules governing collection & handling of information) without information security (protection of information). Some aspects are quite distinct: notice is pure privacy, integrity is pure security. There is also some overlap between both concepts: use, confidentiality, and access to data. business continuity, purchasing, decommissioning hardware, etc. Implementation of KPI tracking (number of outages, breaches, data losses, unauthorized access) and continuous improvement. You should know basics of cryptography. Authentication factors: something you have / know / are. You should know the basics on the web and how it works: basic protocols, cloud, social media..
You can get it done for about 15$ on Fiverr. Do not get ripped off by expensive lawyers :). Notice is a fundamental rights of data subjects. It's not so easy to write a good privacy notice. I hope these notes have helped you. Now if you want to help me, you can link to this page to make it more visible on Google, it will help others in their preparation too! Same problem here! I am seeking a decent comprehensive handbook so as to prepare for CIPP/E. Do you have CIPT textbook? Do you have CIPM text book?